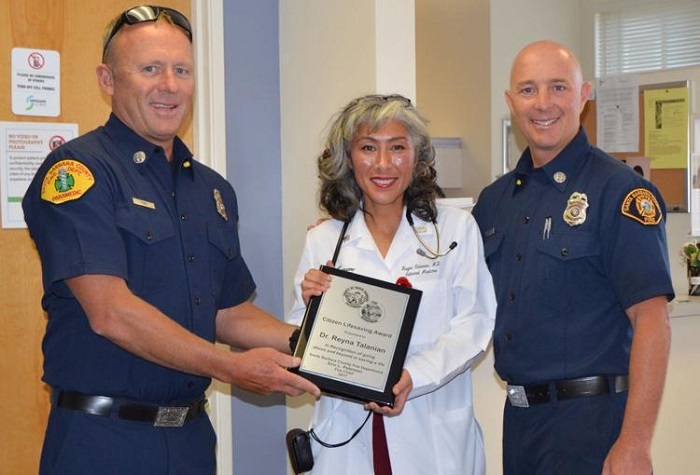 The Santa Barbara County Fire Department recognized Dr. Reyna Talanian of Sansum Clinic Carpinteria for her life-saving work. On June 14, the Santa Barbara County Fire Department recognized Dr. Reyna Talanian of Sansum Clinic Carpinteria for her life-saving work. On the morning of Tuesday August 22, 2017, a San Marcos High School student collapsed into sudden cardiac arrest while on campus. Talanian, along with SMHS Coach Bryan Charles Roth, assessed the student’s vitals and began performing CPR. The quick actions of the pair, coupled with a 911 call, led to the full recovery of the high school student. From left, SBC Fire Captain Jon Ford, presents the recognition award to Reyna Talanian along with SBC Fire Captain Scott Safechuck.